There will be plenty of old-time mountain melodies, bluegrass drive, Irish traditions, and down-home humor when Scenic Roots comes to Liberal for a concert this Sunday afternoon at 3 p.m. at the Seward County Community College/Area Technical School Library. The sister duo of Amber and Erin Rogers, who form Scenic Roots, will take listeners on a journey as they weave their many musical influences together to create a unique blend of roots music. 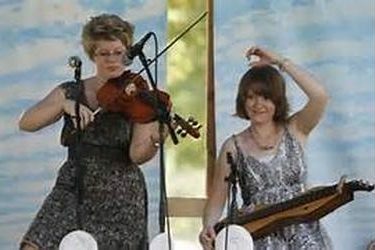 Using mountain dulcimer, fiddle, clawhammer banjo, hammered dulcimer, and powerful vocals, they are keeping mountain traditions alive while adding their own creative flair to every song. The pair, who hails from Concordia, Kansas, has been performing together for more than 10 years. Tight arrangements and consistent performances are the result of Amber and Erin growing up making music. Amber plays the fiddle and clawhammer banjo while Erin plays the mountain dulcimer and piano. For more information, contact the SCCC/ATS Library at (620) 417-1160.